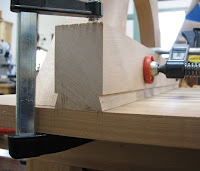 I glued up 5 cherry boards for the table top of the sawbuck table and cut the sliding dovetails beneath the table surface. The dovetail dadoes receive the runners that will be pegged to the legs. 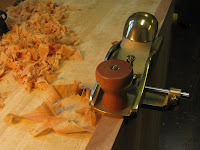 First I squared up the table top and cleaned up the end grain with a Lie-Nielsen skewed angle block plane with nick er. 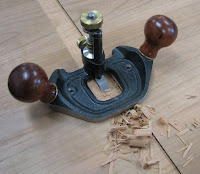 I bought this plane before I knew how to sharpen it and was not very impressed the first time I used it. I hadn't looked at it in years, but took it out, sharpened it on my 8,000 grit waterstone and wow! The shavings in the first photo are from endgrain. Forgive me L-N for ever having doubted you. 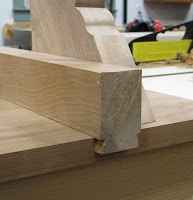 I laid out the dovetail dados and defined the shoulders with an exacto knife and chisel, then used a crosscut saw and router plane to remove the waste. 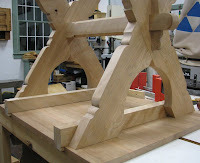 The first dovetail dado took 8 hours for a proper fit but the second one took just 4. Still sounds like a lot, but the dovetails are 25" long and 1.5" wide, so I didn't feel so bad. I followed the same technique as in the past, except I took Stephen Shepherd's advice and flipped the saw guide upside down. This way, you cut on the waste side at all times. It worked very well and it was no more difficult to hold the saw at the inverted angle. 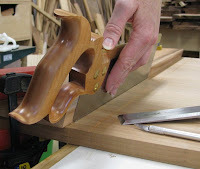 An added benefit to flipping the guide is that the guide itself can be thicker because the lowest part of the saw's handle is opposite the guide (photo #4). A thicker guide provides more support for your saw. The last photo shows the tell tale marks of gentle persuasion.